The Rue Plant, also known as the Ruda and the queen of herbs is a plant that is native to the Mediterranean area. The Rue plant has been used in magic rituals since ancient times and will generally be used today in Wicca and Santeria. Fresh rue herb is the most commonly used, but there are also benefits that come from using rue candles, rue soap and rue floor wash.
Wicca is a common magical belief system which has 8 major holidays known as Sabbats. The Rue plant will be used to celebrate 3 of them which are Beltane, Litha, and Mabon. Beltane is considered the best time of love, protection, and prosperity spells with rue being used for the first two. Litha is the time to celebrate work, success, and passion. Gathering herbs such as rue during this time is believed to make them more powerful when they are used. Mabon is the celebration of the fall equinox and seen as one of the best times to cast protection spells. The Rue plant is commonly used in protection magic by those who practice Wicca. Dried rue is often mixed with spring water and sprinkled around the home to remove jinxes or to invite peaceful energy into the home. Placing a bag of rue above the front door of the home will also help to ward against the evil eye. Rue is also used in Wicca as a lover’s incense. This plant will be mixed with sandalwood and lavender flowers to create incense. Putting the incense within a person’s shoe will ensure their fidelity and tea made from the plant can be used to attract a lover. Santeria is a belief system which combines Spanish and African religious traditions. 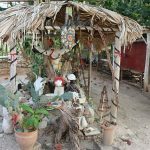 Many of the Santeria practices will revolve around the Orishas which are the deities or guardian angels of the religion. Each follower of Santeria will have their own Orisha and they will learn how to pay them the proper respect. Santeria rituals will have 4 elements to them and they are water, cowrie shells, stones and herbs. Rue is a common and popular plant in purification rituals in Santeria. The cleansing ceremony will be known as despojos and the plant will be tied into bunches. These bunched plants will then be rubbed on a person to purify them. Rue is also often used in purifying baths by practitioners of Santeria. These baths will be used to rid the bather of negative influences and evil spirits. Rue can also be used to create incense which is used to purge negative energies and purify a house. The some will be used to purify the area and the practitioner will need to carry the incense around the house while reciting a prayer, singing or reciting a psalm. There are many magical uses of the rue plant and it is most commonly used by Wicca and Santeria practitioners. In Wicca, the plant is commonly used for protection while it is used for purification in Santeria. What Is Wicca And How Does It Work?